Horror movie by Toshihiro Iijima from 1972. An inventor and his family try to raise funds to feed a giant monster named Daigoro so that he doesn't shrink. Meanwhile, a meteor lands into the sea bringing with it another giant monster named Goliath. Will Daigoro be able to stop Goliath? 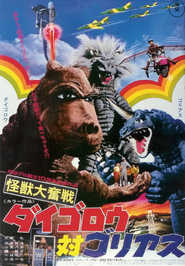 Kaijū Daifunsen–Daigorō tai Goriasu (The Monsters' Desperate Battle–Daigoro vs. Goliath) is a 1972 Japanese giant monster film.